Joel Greenwood, a planner at the Kennebec Valley Council of Governments, will assist the 10-member Second Bridge Committee in studying a proposal for another local site for a bridge over the Kennebec River. SKOWHEGAN — Selectmen on Tuesday night agreed to boost the roster of the town’s Second Bridge Committee to 10 members. The board appointed Joel Greenwood, a planner with the Fairfield-based Kennebec Valley Council of Governments, to round out the committee assigned to study the concept of a second bridge over the Kennebec River. Town Manager Christine Almand said she and Road Commissioner Greg Dore had assumed that Greenwood would be part of the study process, working with the Maine Department of Transportation for planning services. When they found that he was not yet part of the process, they had to add him to the committee. Greenwood, who is employed by KVCOG, is the town of Skowhegan’s contracted planner. He is paid an hourly rate. Greenwood took over planning services for the town of Skowhegan in March 2016. Originally from Manchester, England, Greenwood came to Maine in January 2009. He has a background in municipal service, environmental improvement and housing. As the community planner at KVCOG, he is responsible for assisting with land use issues, comprehensive planning, ordinance writing, bicycle and pedestrian planning, and maintaining and using the geographic information system. In his role as a community planner, Greenwood will assist the town in reviewing and revising municipal land use ordinances, attend Planning Board meetings and review applications for Planning Board action. The committee created to work with state Department of Transportation officials to study the feasibility of a bridge over the Kennebec at another location was formalized by town selectmen in February. At Tuesday night’s selectmen’s meeting, local engineer Steve Govoni said he has experience in bridge design and traffic study, as well as municipal planning. He said he would like to be added as the 11th member of the Second Bridge Committee. Chairman Paul York said the board will look into the possibility. Greenwood and the committee will coordinate study efforts with Martin Rooney, DOT director of program development and management, and with Nathan Howard, transportation planner at the DOT bureau of planning’s scoping division. The committee, the second such panel since the idea first was raised in 1997, will remain in place until June 30, when a transportation department-sponsored study is expected to get underway. 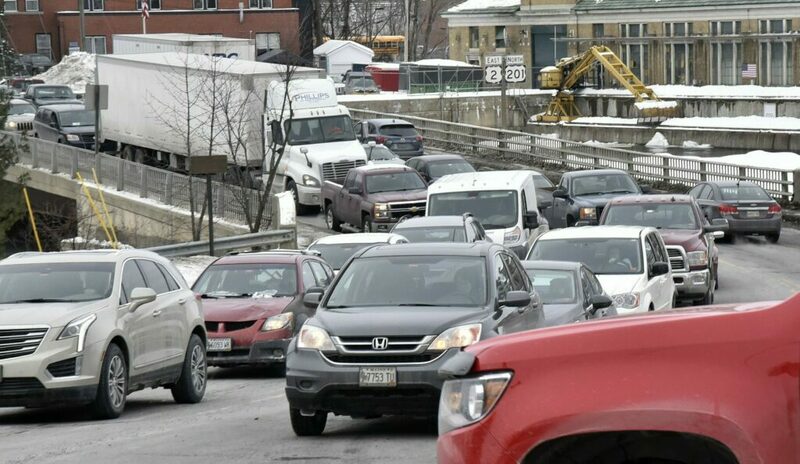 Town officials have said that from 2 to 5 p.m., traffic on the Margaret Chase Smith bridges can back up in all directions, as cars and buses from the high school join the 300-plus New Balance shoe factory workers going home. Schools let out at 2:15 p.m. daily. New Balance employees leave work at 3 p.m. The new bridge would span the Kennebec River and connect U.S. Route 201 and U.S. Route 2, where Main Street meets Island Avenue. Plans include the study of possible locations — up to a mile upriver and a mile downriver, on both sides from the existing bridges on Island Avenue, where the fire station is. The existing bridges are only three lanes wide and carry an estimated traffic count of 19,140 cars and trucks crossing every day, according to 2014 figures. Almand said the request for proposals for the study has been put out and transportation officials are working to negotiate a contract in the next couple of weeks to come up with a schedule and will hold study team meetings. There also will be multiple public meetings on the issue over the next 18 months, with topics including where the second bridge should go. Officials have agreed that the question is not whether there should be an additional bridge, but where it would be located. Almand said the scope of the study is much smaller than it was last time, when $1.8 million was spent to study the idea and nothing became of it. This time around, the study is not expected to cost more than $350,000.